Q. 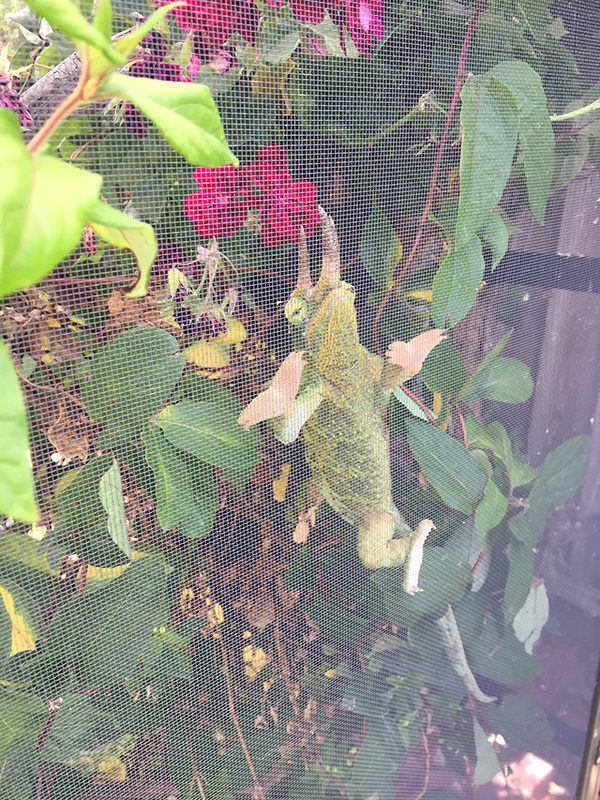 My chameleon constantly climbs the screens walls and I am worried about his nails getting pulled out. How can I ensure his safety? A: Your first question to answer is why he is climbing the walls of his cage. Chameleons generally will find horizontal perching spots and be content to move from a basking spot to a eating spot to a hidden spot. They do not pace their cage to get energy out. The two main reasons your chameleon will not be content is either the cage is not meeting his needs or else he has an internal signal to go find a mate. The cage not meeting his needs may be something inside the cage such as insufficient environmental conditions or else lack of areas he can feel safe. It could be something outside his cage such as your pet cat spending regular time in eyesight or constantly checking out the cage when you aren’t looking. Many people just hang netting or a branch network along the inside of the cage and let their chameleon continue to wall walk. This addresses the issues of the nails, but does not address the root issue with the cage. It is at this point that a keeper can get defensive and say their chameleon loves their cage and you don’t know their chameleon like they do. The discussion has become personal and is no longer about chameleon husbandry. If you find yourself in that situation step back. Here is the issue: you may have done everything “right” according to the best advice of the day and your chameleon could still be wall walking. This does not mean wall walking is okay! It is still a sign of discontentment! What it shows is that you have a challenge ahead of you to figure out. This is what chameleon keeping is all about – being a detective and figuring out what your individual chameleon needs in your particular situation. Everyone’s advice reflects their experiences. It can be incredibly helpful to jump start your husbandry. But there will come a time where you have to figure it out. You may have two chameleons in identical situations and one is happy and the other not. This is not the time to justify your husbandry. This is the time to dive deep into that one unhappy chameleon and figure out what his issue is. Do not give up until he is happy. You owe it to him. And these experiences are also what creates an expert in you. In this Facebook land it only takes six months of regurgitating what you have been told that you start being called an “expert”. But, really, it is when you have solved the problems of the outlier chameleons that aren’t happy with the standard husbandry advice that you start giving back to the community in the form of true understanding.